SVS may have solidified a name for itself with its Prime and Ultra speakers, wireless audio products, and accessories, but these lines could disappear tomorrow and the brand's reputation wouldn't suffer a bit thanks to its world-class subwoofers. And while its gargantuan bass-making machines may get the most attention, it's at the lower end of the lineup where I sit up and start to pay attention. SVS recently sent me their SB-2000 for a roundup of sub-$1,000 subwoofers, but while we are amassing a proper market breadth of such offerings, we decided to also evaluate the SB-2000 on its own merits (you may recall that we reviewed its ported companion, the PB-2000, some years ago). Subwoofer lines from SVS currently include the 1000, 2000, new 3000, 4000, and 16-Ultra Series. To over-simplify a bit, as you climb the ladder, you add a few nice features and certainly more low-frequency depth, but also the ability to pressurize larger spaces with more bass energy. There are, of course, other ways to add more bass energy to your room without moving to a larger cabinet. SVS advocates the use of multiple subs in a room for a variety of reasons. In most cases, a listening room will benefit from two smaller subs versus one large sub, due to the fact that each sub will have different peaks and dips caused by the geometry of the room and its placement therein. In short, installing multiple subs will give you more even bass coverage over a larger number of seating positions. 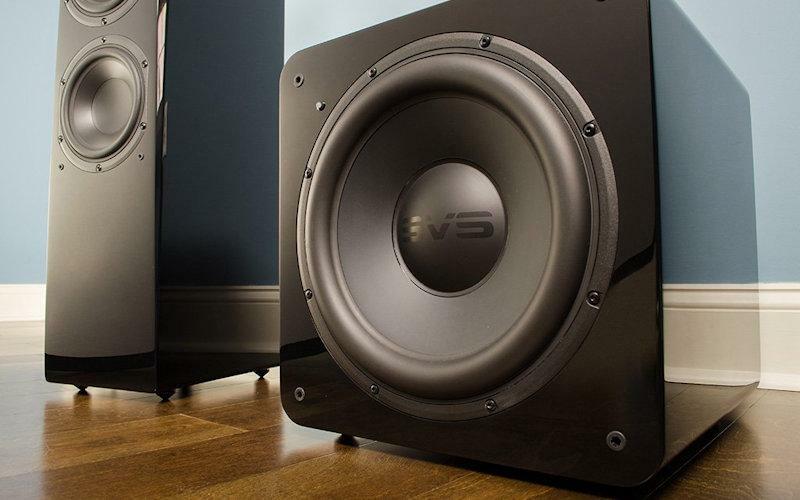 SVS makes available both sealed and ported versions of all its subwoofer lines. Their ported offerings deliver lower bass than their sealed equivalents, though of course, there are many other sonic considerations between these two types of enclosures. The SB-2000 has a 12-inch front-firing woofer with a 500 watt RMS amplifier in a sealed 14.6 by 14.2 by 15.4-inch enclosure available in premium black ash ($699) or piano gloss black ($799) weighing 34.8 pounds. Power modes include Auto-On / On via a toggle switch and 3-12V trigger (3.5mm TRS mini-jack) input to link with other equipment. Audio connections are stereo line-level RCA left and right/LFE inputs, along with left and right RCA outputs. There's also the optional SoundPath Wireless Audio Adapter ($119.99). On the back you will find continuously variable volume / gain control, continuously variable (0 to 180 degree) phase control, and a continuously variable 50 to 160 Hz 12 dB/octave low pass filter with disable/LFE setting (if you are using the LFE output from your surround sound processor, the filters will be set via those controls). There is also a fixed 80 Hz 12 dB / octave high pass filter on the line level outputs. The ported PB-2000 also has a 12 inch front-firing driver but in a ported enclosure that reaches deeper down to 17 Hz versus 19 Hz in the sealed version and extends a bit higher to 260 Hz versus 220 Hz for the SB-2000. The four-inch front port takes up a bit of space and so the enclosure is larger at 20.9 inches by 17.3 inches by 23.2 inches and weighs in at 65.6 pounds--almost double the weight no doubt due to the size difference and the increased internal bracing. The PB-2000 is only available in black ash. So, why does SVS make both sealed and ported versions and which should you choose? I'm sure I will get lots of comments on this, but in my opinion if you are creating a surround sound system predominantly for gaming, movies, and TV watching, you might prefer the punchier punch and thumpier thump of a ported enclosure, but if you prioritize music over explosions and bullets and such, one might prefer the slightly "tighter" sounding sealed version. This is not to say a ported enclosure can't faithfully reproduce music and a sealed box can't provide an impactful surround sound theater experience--just that these are the main sonic differences between the two and in the specific case of the PB-2000 and SB-2000, there is the size and weight difference noted above as well. For the two room sizes I auditioned these in, I slightly preferred the SB-2000, and while I didn't have two of them to try, I have every reason to believe spreading out the coverage with two SB-2000 would be absolutely amazing. In case you were wondering, my main home theater is 30 feet by 26 feet with 14-foot ceilings, and my secondary room is 14 feet by 12 feet, with 12-foot ceilings. The SB-2000 provided plenty of power while cleanly extending the lower registers smoothly and accurately. Handling "Locomotive Breath" off the seminal Aqualung album by Jethro Tull as well as Mahler's Sixth requires another level of sonic craftsmanship and the SB-2000 performs exceedingly well--in fact, for this price and at this size I really could not find a better subwoofer. It's fast, it's clean, and it's powerful. Across many varied musical genres, the SB-2000 added depth and detail in the lower frequencies while letting the mids breathe and resolve even dense selections. The SB-2000 provided all the impact and low frequency punch even the most action-packed movie might demand. Wireless connection via the optional SoundPath Wireless Audio Adapter was simple, quick, and easy, and once paired, never required any further interaction. I could not detect any latency issues whatsoever. No room correction or app control are included at this level, however if you are using the LFE input, your surround sound processor (or AV receiver) likely has you covered. If you require wireless audio transmission, the SoundPath Wireless Audio Adapter is more expensive than offerings from others in this class. I have a mental sonic imprint of what I look for in a sub, which includes impactful, solid, deep yet distortion-free bottom end with no lumpiness, and this affordable sub delivers in spades. When my listening sessions were complete, I wanted to go back for more. To find a no-compromise favorite at these prices is nothing short of astonishing. If your budget just doesn't quite allow you to spend $699 or $799 on a sub, have a look at the MartinLogan Dynamo 600X ($599.95) or the RSL Speedwoofer 10 ($399). But if the SVS SB-2000 fits your budget, look no further. In its price range, it's in a class of its own as far as sealed subwoofers go.